The race to 2014 Namibia CAF Women Championship will see a record number of 25 teams vie for the seven places at the ninth (9th) edition of the African Women Championship to be held from 11 to 25 October 2014. This follows the draw for the qualifiers for the tournament conducted recently in Cairo. The top three teams from the last championship held in Equatorial Guinea namely winners, Equatorial Guinea runners-up South Africa and bronze medallists, Cameroon have received first round byes and will only join the qualifiers from the second round. The road to Namibia 2014 will start on 13/14/15 February 2014 as the first leg matches takes place with the second leg matches scheduled for 28 February/01/02 March 2014. The second and final round matches will be played from on 23/24/25 May 2014 and the second leg matches will be contested on 07/07/08 June 2014 to decide who joins Namibia for the actual championship in Windhoek. Nineteen months after the celebration of the twenty-eighth edition of the African Cup of Nations (CAN), the joint Gabon-Equatorial Guinea COCAN organizing committee met this past weekend in Malabo. The Gabonese delegation of the Organizing Committee of the CAN (COCAN) was led by its chairman, Cristian Kerangal, accompanied by several members of this committee. 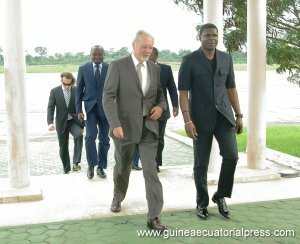 Upon their arrival in Malabo, they were greeted by the Secretary of State for Youth and Sports, Ruslan Obiang Nsue, acting as the executive president of the COCAN Equatorial Guinea. Meetings held in the Ministry of Youth and Sports addressed the analysis and evaluation of the past twenty-eighth edition of CAN held in Gabon and Equatorial Guinea from January 21 to February 12, 2012. Then the General Secretariat read the congratulatory letter from the Confederation of African Football (CAF), which congratulated our two countries, reaffirming that the edition of the CAN 2012 in Gabon and Equatorial Guinea had been the best of those organized until now. In addition, the CAF invites the two countries to continue working together, and proposed requesting the organization of the CAN 2017, having verified the persistent political instability in the host country: Libya. 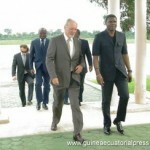 The Gabon-Equatorial Guinea COCAN agreed to submit the CAF’s proposal to their respective governments. CHESTER, Pa. – Before stepping onto the field last Saturday, Philadelphia Union midfielder Michael Lahoud looked down at the FIFA emblem and World Cup qualifying patch on his Sierra Leone jersey and got chills. The game against Equatorial Guinea had no actual World Cup implications and Lahoud would end up playing only 15 minutes in a 3-2 win, but for the Union midfielder, those 15 minutes were extremely special. Leone Stars defeated Equatorial Guinea by three goals to two (3-2) past Saturday September 7 in their last group B match in an empty stadium in Freetown. Both teams failed to proceed to the next stage of the Brazil 2014 World Cup. Mustapha Bangura put the home side in the 21st minute of play, and Leone Stars skipper Ibrahim Obreh Kargbo made it two nil in the 38 minutes. In the 68 minutes, Alhassan Kamara made it three to put the home side in a comfortable position. The visiting team came on strong in the last 10 minutes of the match to score two goals which put the stadium in a frenzy thinking that the visiting team will level the score. This is Leone Stars second win in the competition after drawing two and losing two to end the qualifying series with eight points securing third spot, while their opponent failed to win a single match after losing 4 matches and drawing 2 to secure 2 points staying at the bottom of the table. This is the first win of Coach Jonathan Mckinstry in 3 matches after a draw and a loss. I-League side Pune Football Club Monday signed Spanish-born Equatorial Guinea international and former Villareal CF ‘B’ striker Raúl Iván Fabiani Bosio for the 2013-14 season. Twenty-nine-year-old Raúl becomes Pune FC’s fifth signing in this window and joins playmaker Douhou Pierre as the second player in the foreign quota. He also becomes the first European player to sign for Pune FC. Raúl joins Pune FC after a successful season with Valencia-based club Huracán CF in the Segunda Division-B (Third Division) during which he guided them to the play-offs final only to lose out promotion on away goals. At 6′ 6″, Raúl interestingly, is the tallest striker to be signed by the club since promotion to the I-League in 2009-10. Raúl said he was happy to be in India and be a part of Pune FC. “I’m willing to put in a lot of effort and want to help Pune FC win the league. I will try to score as many goals as possible,” he added. Raúl started his career at top-division side Villareal CF (2001) coming through the ranks as a youngster. He was later promoted to their ‘B’ team (2003) and started playing in the second division. Born to a Spanish father and an Equatoguinean mother, Raúl holds both Spanish and Equatoguinean nationality. In 2011, he was naturalised to play for the Equatorial Guinea national team with the 2012 African Cup of Nations (co-hosted by Equatorial Guinea and Gabon) being his biggest moment. The striker made two appearances against eventual champions Zambia in the Group Stage and against Ivory Coast in the quarterfinals. Overall in his career, he has made a total of six appearances for Equatorial Guinea. Now it’s not just the boys of the National Nzalang or girls of the Nzalang, big winners of the Women’s CAN, who rejoice us with their victories; now the Equatorial Guineans residing in Spain are about to achieve the deed of being proclaimed winners of this football championship. We are referring to the 5th Integration World Cup organized by the Sports and Cultural Association of Immigrants of Aragon (ACDIA), which is chaired by the Equatorial Guinean Juan Pablo Nguema. In this edition teams from sixteen countries have participated, divided into four groups. That of Equatorial Guinea has made ​​it to the final after a brilliant intervention in which it eliminated the powerful teams from Brazil and Spain. 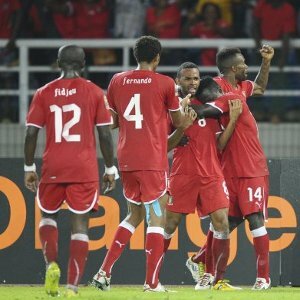 The Equatoguineans defeated the Spanish host 4-3. There is, moreover, the fact that Equatorial Guinea will fight for the trophy on August 3, the national holiday. The team will face Ecuador, who won in the quarterfinals against the team of Guinea Bissau and in the semifinals had to reach the penalty phase to eliminate Colombia. Equatorial Guinea is the latest addition to our salute of Spanish Speaking nations. It is the only country in Africa where Spanish is an official language. Equatorial Guinea is currently 64 in the FIFA Coca Cola ranking ahead of Haiti and Cameroon. In the Continental ranking, it ranks 11th place behind South Africa and ahead of Cameroon. The country’s highest FIFA rank was 59th place in April 2013. Its lowest ranking was 195 in December 1998. Equatorial Guinea has confirmed they will not be sending a team to the COSAFA Cup Zambia 2013, despite assurances of their participation last month. The loss of the Central African side reduced the field to 13 teams and means Group A will be contested by three sides – Namibia, Mauritius and Seychelles. The Equatorial Guinea Football Association have cited a lack of funds for their withdrawal at the 11th hour, having themselves been a replacement for East African guests Tanzania. The COSAFA Cup, Southern Africa’s showpiece regional championship, returns after an absence of three years, with Zimbabwe looking to defend the title they won on home soil in 2009. The tournament starts on July 6, with the final to be played on July 20 in Lusaka. The Nzalang and the Aragonese of the Prainsa tied 2-2 in a match that could have been decided by the captain Ayongman in a penalty shot that was stopped by the Zaragoza goalkeeper in the 86th minute.